In addition to hitting more home runs than any other players in the history of the game, 500 Home Run Club members also won key games with some of the most amazing WALK-OFF shots ever witnessed. Editor’s Note: A walk-off home run is called a "walk-off" when it ends the game by giving the home team the game winning run in the bottom of the final inning of the game — either the ninth inning or extra innings in case of a tie) because the teams WALK OFF the field immediately afterward. On October 6, 2007, the newest member of the 500 Home Run Club - Bo Sox slugger Manny Ramirez - brought all of his teammates charging onto the field to celebrate his three-run Walk-Off Home Run over Fenway’s “Green Monster”. Man Ram’s timely blast beat the Los Angeles Angels 6-3 and was only the fifth walk-off home run in Red Sox post-season history. The homer gave Boston a 2-0 lead in the best-of-five American League Division Series and sent them on their way to an eventual World Series '07 title - the second in four years for the once beleagured Beantown team. Other recent 500 Home Run Club inductees Jim Thome and Alex Rodriguez, both performed this elite feat in 2007. “Big Jim” Thome “joined the club” on September 16, 2007 with a two-run Walk-Off Blast in the bottom of the ninth inning to give the Chicago White Sox a 9-7 victory over the Los Angeles Angels. On April 7, 2007, Alex Rodriguez launched Baltimore pitcher Chris Ray’s offering into the Yankee Stadium seats. The Walk-Off blast - A-Rod's second in the game - ended the contest 10-7 in favor of the Yankees and tied Rodriguez with Cy Williams and Vern Stephens for the most Walk-Off grand slams (three each) in major league history. 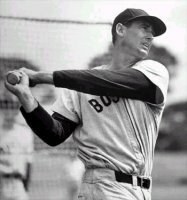 During extra innings of the 1941 All-Star game, “The Splendid Splinter” Ted Williams came to the plate with the AL team just one out from defeat and hit a 1-1 pitch off the right field press box for a three run homer that clinched a 7-5 victory. He later said, "I just shut my eyes and swung." It is the first All-Star game to be decided in the final inning. “Hammerin’ Hank” Aaron provided one of his numerous crowd pleasing moments, when, on September 23, 1957, he sent an 11th inning, two out fastball from St. Louis Cardinal pitcher Billy Muffett deep into the Milwaukee County Stadium seats. Aaron’s WALK-OFF homer sealed the Braves’ 4-2 win and clinched the Braves' first pennant since moving to Milwaukee. Willie McCovey hit more Grand Slams (17) than any other National Leaguer, and more pinch hit Grand Slams than any other major league player. His final pinch hitter grand slam came on 05-30-1975 after he was traded to the San Diego Padres, clinching a come-from-behind win over the New York Mets. 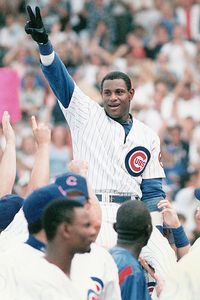 Chicago Cub great Sammy Sosa wowed the Wrigley Field faithful with twin grand slam game winners on July 27th and 28th of 1998. Milwaukee Fans also got the thrill of seeing one of their heroes hit a WALK-OFF shot during the post-season that year, when, on October 6, 1957 during the 10th inning of game four of the World Series, Eddie Mathews hit a two-run WALK-OFF shot into the stands of County Stadium in Milwaukee against Yankee pitcher Bob Grim County Stadium to tie the series at two games. On October 10, 1964 during the ninth inning of Game 3 of the World Series, Mickey Mantle slugged the first pitch served up by St. Louis Cardinals pitcher deep into the Yankee Stadium stands delivering a WALK-OFF ending that thrilled the New York fans. On October 18, 1988 Mark McGwire gave Oakland its only win against the Dodgers when he hit a gargantuan WALK-OFF blast off of LA’s Jay Howell with one out in the 9th inning. It was also the first time that two walk-off home runs were hit in the same postseason series; since Kirk Gibson of the Dodgers had done so three days earlier during the first game of the series. – In Japan, a walk-off home run is known as a sayonara home run.